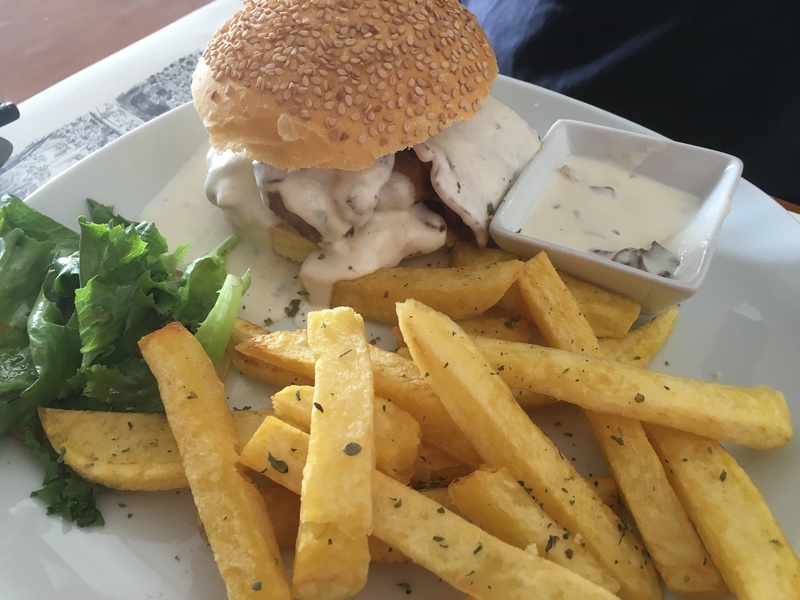 Os Bordallos is a small hamburger restaurant tucked away in the old part of Cascais. 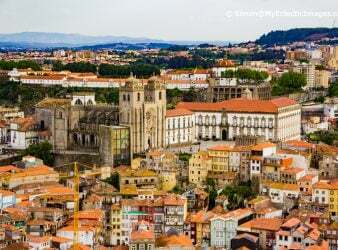 Following the little map we’d pulled up on our iPhone, we found ourselves wandering through meandering narrow streets constructed in the traditional Portuguese way, with cobblestone. In this area, the cobblestones are made of marble, and are quite lovely. But beware, they can be very slippery! We managed to find Os Bordallos without any trouble. 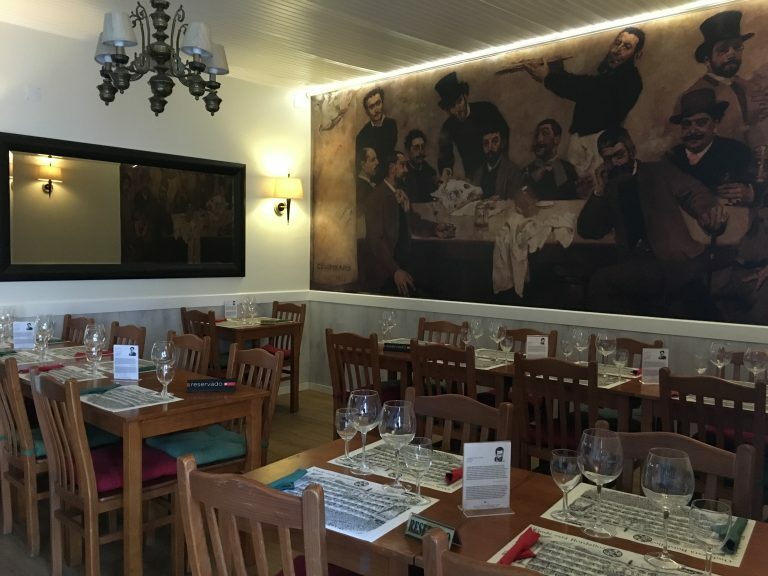 The name Os Bordallos comes from the owner’s ancestor Raphael Bordallo Pinheiro, one of the most influential people of the nineteenth century Portuguese culture. 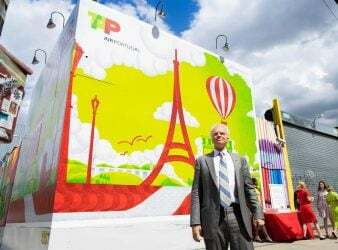 He was known mainly for cartoons and ceramics. His ceramic production became well known, especially for its artistic quality, not only at a national level but internationally as well. Os Bordallos occupies a rather small indoor space, with a few tables available to sit outside as well. The menu? Mainly hamburgers, but have no fear if you don’t eat beef! They also serve a cod burger and a vegetarian burger. 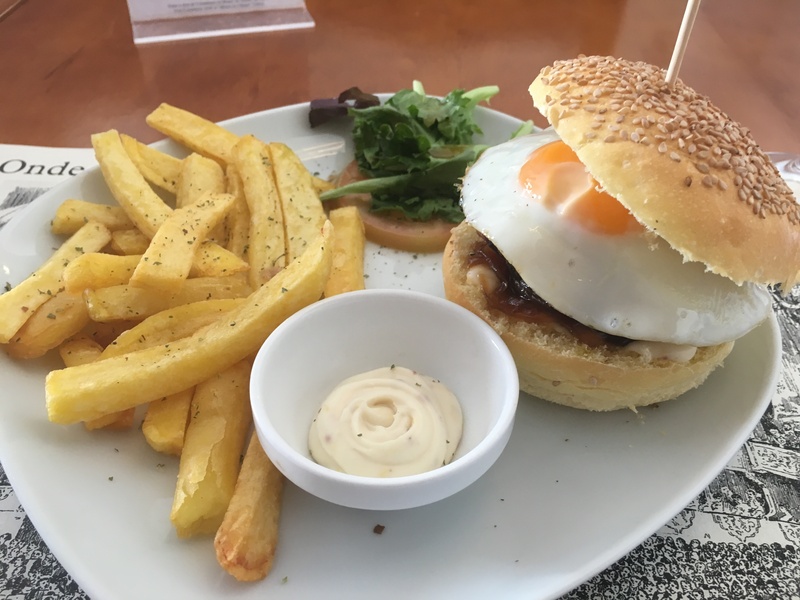 We ordered their two most popular burgers on our first visit, they are both made with beef. First was the O Portuguese, which comes with garlic, Serrano ham, fried egg, parsley and Portuguese sauce. The other was the O Bordalliano, which comes with bacon, red onion, slices of grilled Picanha (rump cover- or sliced steak as I would call it), cheese and creamy mushroom sauce. Both were amazing, but the Picanha was our favorite. Wow! We had one with french fries and one with their homemade crisps. Now, normally I would choose fries over crisps (i.e. chips), but these were some of the best crisps I’ve ever had! They were so thinly sliced, and so crispy. Yum! 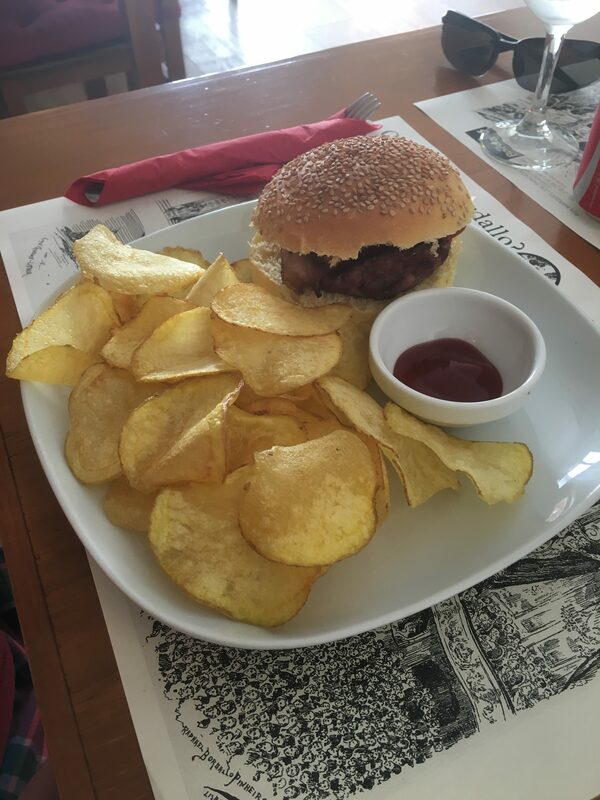 Our son ordered the children’s option, which is a great deal at only 5.50 euros you get a burger, drink and dessert. Os Bordallos also offers beer, wine and other alcohol (including sangria). They even offer the popular Caipirinha, which is actually Brazilian, but very much loved here…and rightly so! It is made with made with cachaça, sugar and lime. Cachaça, also known as Pinga or Caninha, is Brazil’s most common distilled alcoholic beverage. If you’re curious and would like to try a Caipirinha at home, try Bobby Flay’s recipe. Of course, Os Bordellos also has the typical assortment of sodas, ice tea, etc. For dessert we had the key lime pie. We love key lime pie, and though this one wasn’t traditional key lime it was really very good! Theirs is a lime tart on an Oreo cookie based crust. 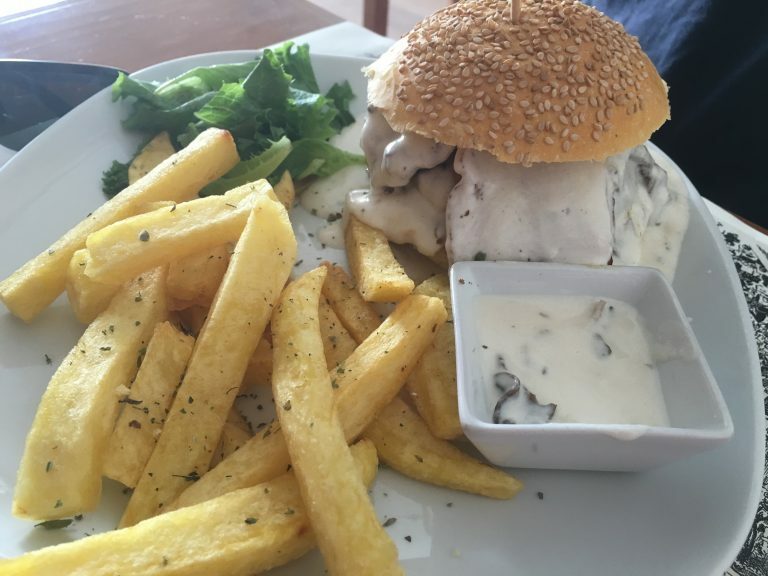 On our second visit we tried the vegetarian burger and the fish burger. 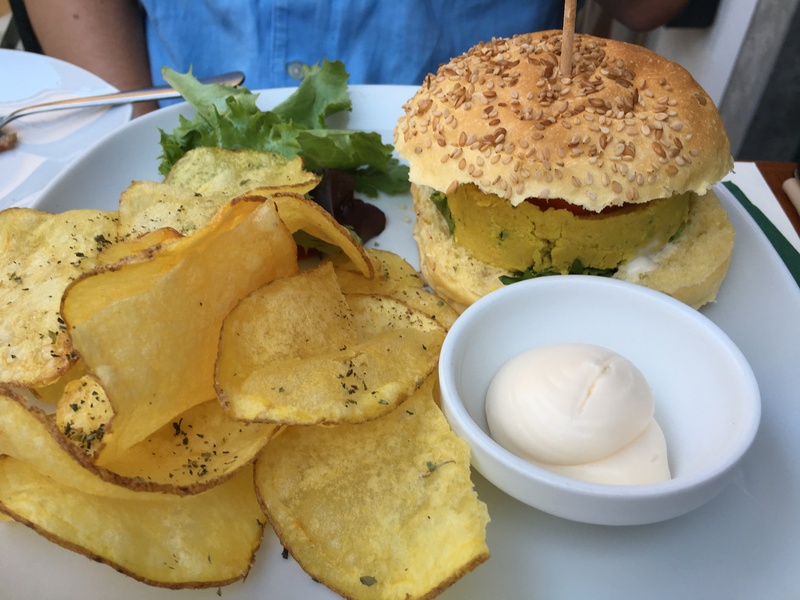 The vegetarian burger is basically a falafel patty that hasn’t been fried. The fish burger wasn’t like those I’ve had in the past as it wasn’t super crispy on the outside, but it was very good. The lime mayonnaise was fabulous and we intend to make some at home! 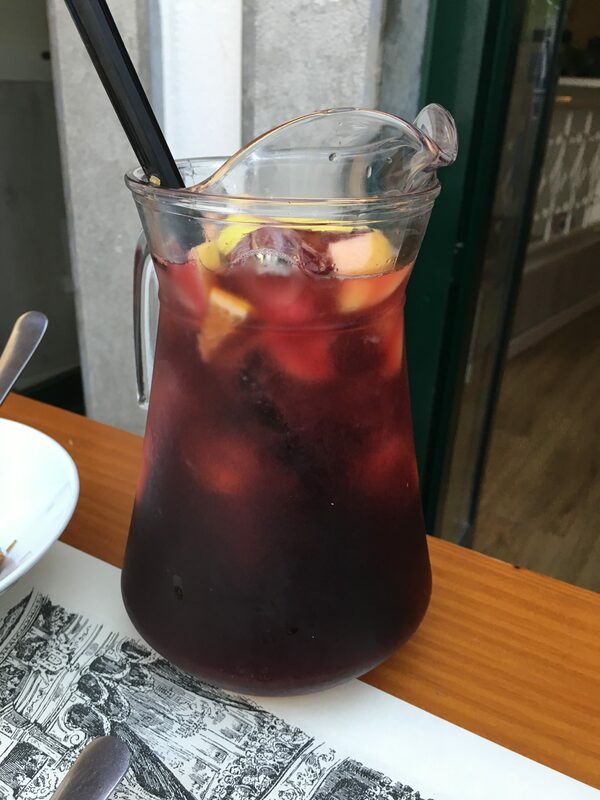 On our second visit we ordered a pitcher of the red sangria and it was also very good! The service at Os Bordallos on both occasions was fantastic. The waiter was extremely friendly and knowledgeable. He took the time to explain things and offered his suggestions. We really enjoyed our entire experience! They do not have a website, but they do have a Facebook page. 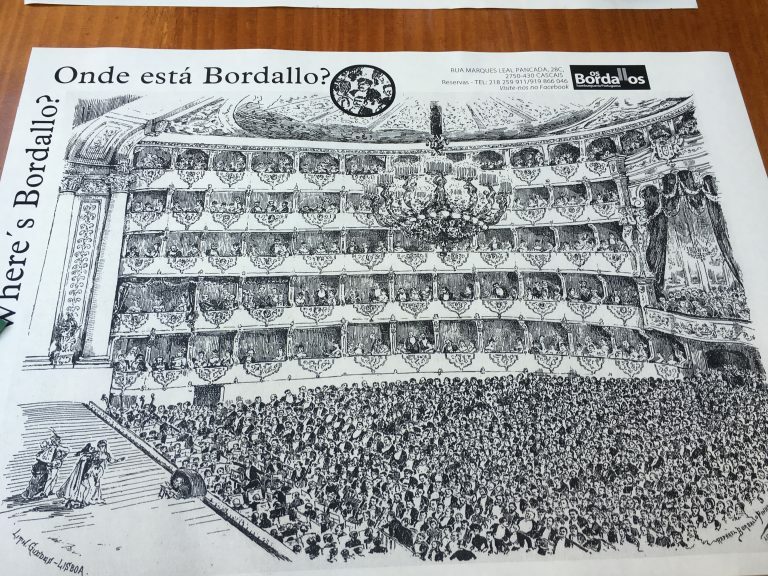 Also, I found an online copy of Os Bordallos’ menu. Looking for a place to stay in Cascais? Read our reviews on VillaCascais Guesthouse and Hotel Cascais Miragem.